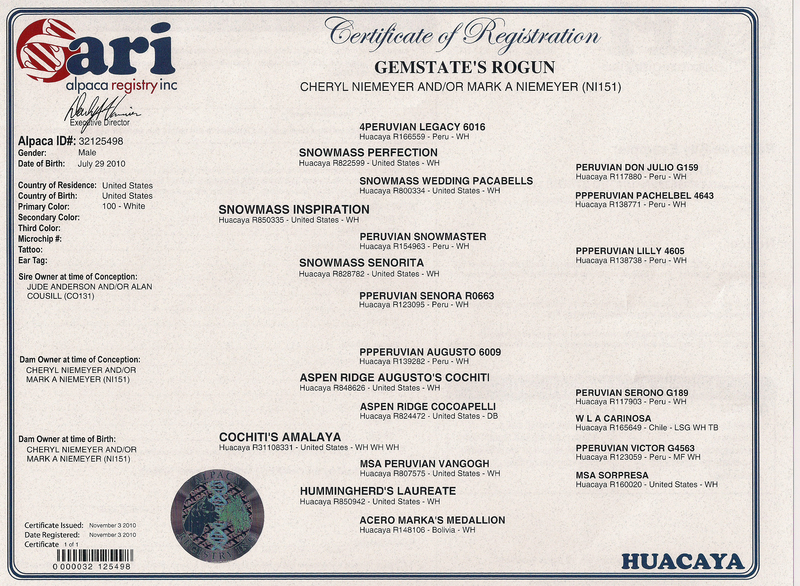 Gem State Rogun has certainly met the requirements for herdsire status on our farm. He has the genetics, conformation, and fleece statistics that moved him into the herdsire barn. Both his dam and his dam's sire are multiple fleece Champions while his sire placed 3rd at Futurity and 2nd at AWE in large competitive classes. 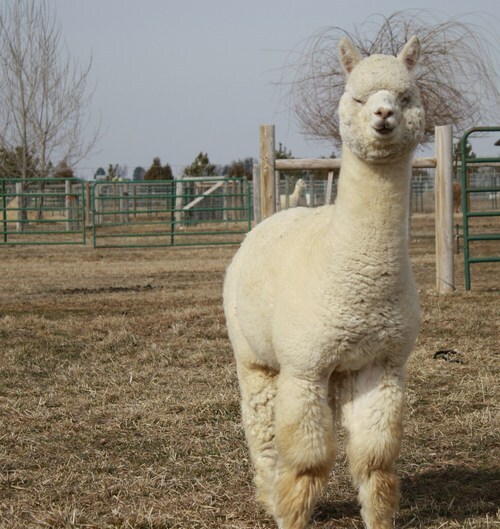 Rogun's fleece exhibits great density, sustained fineness, extreme brightness, and eye-catching character. 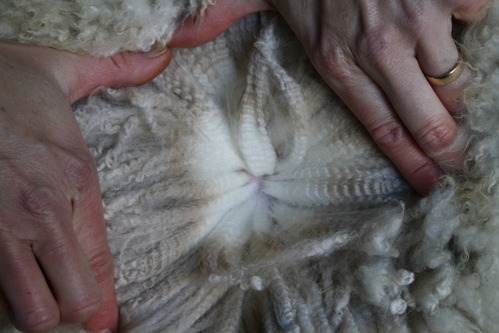 Simply put, when you put your hands in his fleece the degree of softness and bundling of his fiber are amazing. 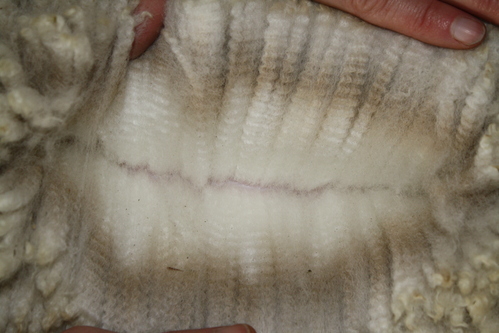 Mike Safley, 2011 AOBA National Show- "This young male has a superior fleece that is consistent throughout"
Wade Gease, 2012 Alpacapalooza Show- "The fiber on this male is stunning. It's bright and almost sparkles when you open it. 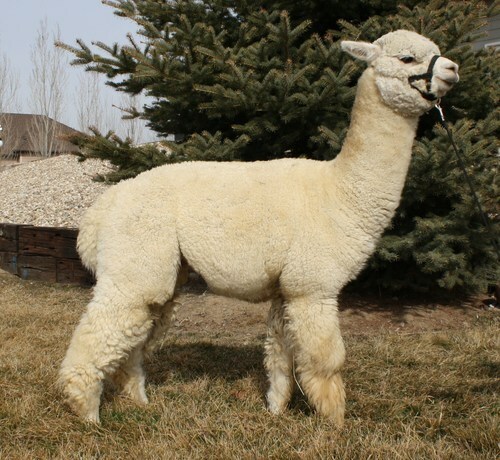 Very impressive"
Cathy Merkley, 2012 Northwest Alpaca Showcase- "This male combines excellent density and fineness with a high degree of character. This is what we want to be breeding for"
Rogun's pedigree is one to study for genetic prepotency. 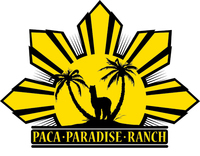 In it, you will see the top names that have been a foundation of excellence for breeders throughout the industry: Legacy, Don Julio, Snowmaster, Augusto, Victor along with powerful dams Pachelbel, Senora, and Lilly. 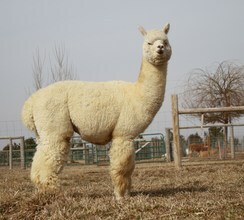 Rogun has now settled his first females here at the farm and we are anxiously awaiting their arrival. If you are looking to suppress guard hair, infuse fineness and character, and improve density Rogun is a male to seriously consider. Rogun is a proven male that is demonstrating excellent qualities in his offspring.